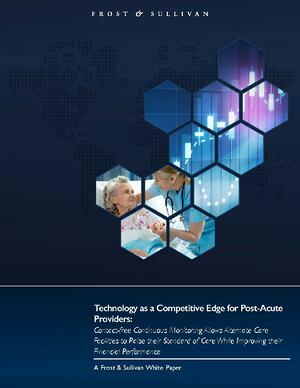 Yet as a business strategy, it also exists in direct opposition to the traditional post-acute care plan, which has “historically pursued high-profit, low-risk patients, such as those recovering from orthopedic injuries and surgery, even if they generate lower revenue on average than more complex patients,” write the authors of a new white paper from Frost & Sullivan. Yet those authors go on to argue strongly in favor of changing that tradition. Exploring the methods by which today’s post-acute facility can achieve a stronger competitive advantage, they note that the acceptance of more high-acuity patients — i.e., those that “may require ventilation, dialysis, parenteral nutrition, IV medications, left ventricular assist device (LVAD) therapy and other interventions” — is becoming a strategic imperative. The rationale? Accepting high-acuity patients doesn’t just expand a facility’s revenue base; it also offers a better footing to retain relationships with important referrers. And at a time when higher acuity patient referrals are on the rise thanks to the growing preference for home-based treatment of lower acuity cases, refusing any referral could jeopardize a valuable relationship with the referrer. Now, the good news: With the advent of new clinical technologies like contact-free continuous monitoring, treating more high-acuity patients can be done more efficiently, and at a lower risk, than before. Because it more closely monitors vital signs and level of movement, continuous monitoring provides facilities with a powerful tool to give these patients the advanced level of clinical attention they require. Contact-free continuous monitoring “can be a critical tool to allow post-acute care facilities to more efficiently extend their existing labor resources across more complex patients, creating an alert system and trend line with detail that can provide significant insight into a patient’s condition,” the authors write. It’s also worth noting that, whether or not a facility wants to accept high-acuity patients, today’s competitive market may ultimately demand that they do so. To that end, continuous monitoring can help improve “the level and quality of care” offered, while also preparing facilities for a payment model that’s built around episode of care instead of fee for service. “The most progressive post-acute facilities are preparing for a future payment model that is built around an episode of care and not fee-for-service,” they note, adding that continuous monitoring enables both. Those numbers are particularly noteworthy give the competitive nature of the alternate care market, where profit margins are razor-thin and “the importance of making the right strategic investments that deliver the greatest ROI has never been higher,” they note. “Medically-complex patients are more challenging to treat and to do so profitably, but they usually have a higher daily reimbursement rate and a longer length of stay. If managed appropriately, the ability to serve these patients sets a facility apart and the associated revenues are much needed,” they add.